Our dairy goat herd are loved and cared for here on the Dartington estate, allowing them to produce the highest quality milk. You can enjoy it as it comes, as yogurt or our award winning goat milk kefir. We also produce a delicious ice cream range on-site, which we make by separating out the curds to produce extremely creamy ice cream that's naturally lower in fat. If you'd like to give our ice cream a try then stop by the farm to pick up a tub, you can even try your hand at milking the goats while you're here if you book into one of our farm experiences. Get a hands-on experience milking our lovely but mischievous dairy goats and our friendly Jersey cows. 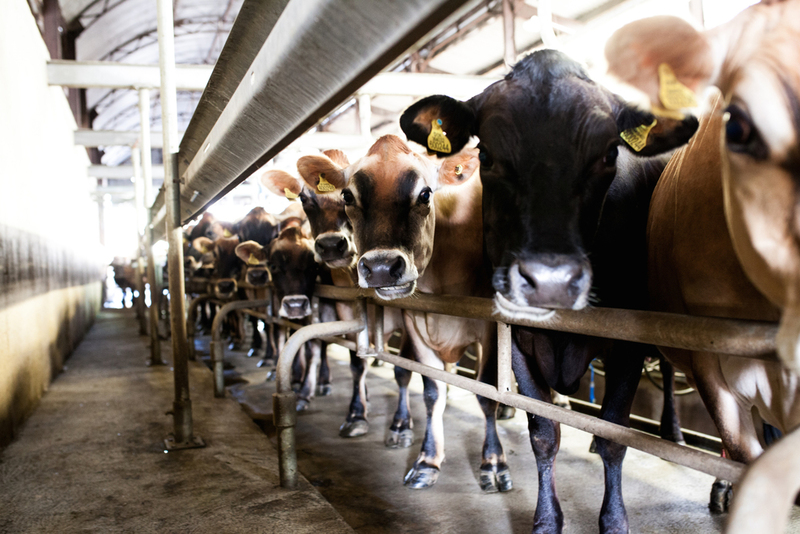 We'll greet you and introduce you to the farm before you help us bring the Jersey cows in for milking. As the cows line up in the parlour we'll talk you through the milking process and those over the age of 16 will have the opportunity to come down into the parlour and have a go themselves. Next we'll move onto the goats, moving this slightly more rambunctious herd through the parlour can be a lot of fun and is a very hands on routine where you get to milk and feed them. When milking has concluded we finish up the experience with a visit to the calf pens and an opportunity to play with the goat kids. Spend an exclusive day on the Dartington estate with farmers Jon and Lynne Perkin, running the goat and Jersey dairy herds at Old Parsonage Farm. You’ll rise with the dawn chorus to start at 6.30am, ready for the first milking session of the day. Then it’s feeding, watering and bedding up the animals. Depending on the time of year that may be cows, goats, calves or, in spring, kids and lambs. All the animals also enjoy a bit of company – the goats are particularly playful and the cows like nothing better than a good grooming. After a hearty farmhouse breakfast the day may take you in any direction (as all farmers know!) – you could find yourself up to your elbows delivering the newest arrivals at the farm, helping to move herds around the estate or getting involved in land management tasks like fencing and hedge laying. There’ll certainly be plenty of opportunities to try your hand at milking in both the cow and goat parlours. The day finishes at 6pm, following the afternoon milking of the friendly purebred Jersey herd. By the end of the day you’ll certainly know what Devon farm life feels like.